Treasure is embarking on a new and improved fitness program. It's hard to keep her fit and trim because she is not as active as the other dogs. They want to go, go, go (and quickly!) on their walks and they enjoy running together in the nearby field. Treasure's pace is one of leisure, carefully smelling her way through a walk. She prefers to walk slightly behind me so she can follow my scent. I would not be able to walk her with my other dogs and give them each what they need and want from a walk. This means that I need to make it a priority to take them out separately. When Shelby was alive, she and Treasure both walked slower and we would take a separate walk around the yard - just us three girls. As Shelby slowed down even more, those walks became shorter and eventually all but stopped except for her really good days. I didn't make it a priority to take Treasure out again for a walk by herself. So, she spent a lot of this winter in the house. She started to put on a couple extra pounds, so I cut back on her food amount to help with that. And although she is now a good weight, she is out of shape. I want her to live for a long time, so I want her muscles, heart and lungs to stay strong and for her joints to remain flexible for as long as possible. This means - exercise! Now that the weather is getting nicer, I will be focusing on building up Treasure's endurance for walking with me, and then experimenting to see if we can quicken the pace just a bit. It is unlikely that Treasure will go any faster than a slow trot, because she can't see what is in front of her, so she's learned to go at a more conservative pace to avoid smacking into something hard or falling into a hole in the ground. But I would like for her to be able to go on longer walks with me. Treasure does enjoy her time with me learning tricks and doing nosework. She does get some exercise doing various tricks that allow her body to stretch and move in different ways and improve her balance and proprioception skills. I have balance discs, and a balance ball and peanut and each of these challenge her to use her muscles and help keep her toned. I know all too well that starting up a new exercise program can leave muscles sore and tired. I also learned recently that if there is pain during a workout, the muscles protect themselves and don't work as hard, so they are not really building any strength. So, my goal is to go slowly enough that Treasure is always having fun and ready for more when we stop, and that she never gets sore. That's no fun for anyone, and I want her to build strength, so it's important to keep her under that pain threshold. Walks are such good exercise physically, but walks also allow Treasure to experience different surfaces, smells, textures, and sensations. She loves to feel the warmth of the sunshine on her coat, and to smell all the amazing farm smells on the breeze. Each new surface - grass, gravel, black top, wood - is a new experience for her and requires her to adjust her balance and pace somewhat. I'll try to keep the readers updated on our new fitness adventure. How did you get her comfortable with a leash? 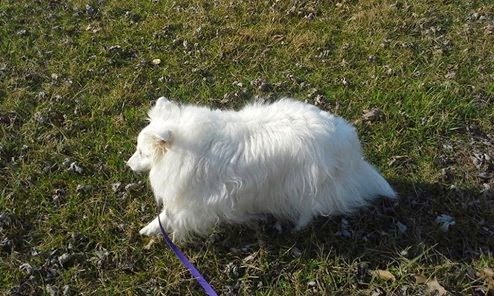 I have a little sheltie pap mix that is totally blind and she likes to go on walks with me, following right behind me, but she balks at a leash. So, when we walk, she is right behind me but off leash. I've tried letting her drag the leash but she freezes. I've had other blind dogs, those that became blind, and I noticed the same thing...they refused to walk on leash. Yes, I would like to have a treadmill for myself and my dogs too! Maybe one day! I have written a blog post about leash training blind and deaf dogs here http://your-inner-dog.blogspot.com/2012/02/leash-training-blind-deaf-dogs.html Also, I cover the topic extensively in my book, Through A Dark Silence: Loving and Living with Your Blind and Deaf Dog. Treasure likes to walk behind me so she can trail me with her nose as to where I go, especially in new places. When we are some place that she knows, she will often come up more beside me. I also never use the leash to force her in any way, so she never learns to fight or balk at the leash being on. Leash being on always means good things!